The 'Christmas Tree' skew chisel is 12mm wide and is flared towards the blade. However, there is a slot ground into the blade behind the cutting edge which is used to create the Christmas tree effect when turning. There is a fitted handle supplied, made from ash with a matt unpolished finish. I also liked the look and feel of the handle and the unpolished finish makes for a firm grip. 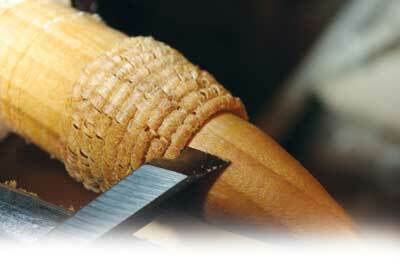 Sharpening is fairly straightforward using a conical hone for the inside and a flat diamond hone for the outside. The tool was tested on three different woods: dry ash (Fraxinus excelsior), lime (Tilia vulgaris and very wet hazel (Corylus avellana). I started by preparing the blanks, shaping the outside to a cylinder first with a bowl gouge and then cutting a chuck mounting spigot for my gripper jaws. 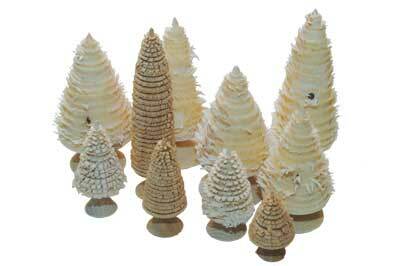 I made my trees between 50mm and 100mm tall from base to tip and around 25mm at the largest diameter. Leave a portion at the base to turn yourself a trunk and base 'stand' at the end of the process. I found that the tool works most easily on a convex surface so curve the tree gently from bottom to top rather than making its profile a straight line. Working from the bottom of the tree upwards, starting from a point about 6mm above the lowest branch position. Lay the tool along the tree with the long and short points making an imaginary line parallel to the centreline of the lathe and gently rotate the skew anticlockwise by about 10° so that the notch in the skew engages in the wood. Exert a steady gentle pressure and as the tool enters the wood the cut edge of the timber slides up the skew blade notch, engages with the top of the notch and turns itself over, creating a curled branch. At this stage the nature of the different woods became apparent. The ash was quite brittle and some of the branches split off whilst being turned. The hazel on the other hand was so springy that after curling it straightened out and when dry took on the look of a mohican haircut. The lime was the best wood for the purpose and it curled back easily and retained the curl when dry. Both the ash and the lime curled most easily after being given a liberal coating of orange oil. After practising for an hour perfecting the technique, the tool was a lot of fun to use. Most people love Christmas and the associated knick knacks that go with it. I think there is scope to change the shape of the trees, etc. and my wife feels that there is also scope to use the tools to create Christmas decorations and hanging icicles. The tool felt comfortable to use, well balanced and I liked the feel and fit of the unpolished handle. Anyone who does craft fairs and the like may find this a useful addition to their toolbox.